In the community you will hear Old Providence referred to most often as simply “Old Providence” or as “Old Providence ARP Church”. On occasion you will hear it referred to by its full official name, “The Old Providence Associate Reformed Presbyterian Church”. We normally expect the name of an organization to tell us something about the organization. And the name Old Providence Associate Reformed Presbyterian does tell us about the identity of the Church. The five words making up the name, Old Providence Associate Reformed Presbyterian give us important information. First, we might ask why is the name “Old Providence” and not just “Providence”? It is a historical name. Records indicate that Old Providence was in existence as a congregation in mid-summer, 1742. At that time it was known as the South Mountain Meeting House. The Baptismal Records of the Rev. John Craig indicate he performed baptisms that summer. Apparently our forefathers worshipped in this area from about 1740 on. At some point a log structure was built for worship. We know that late in the 1740’s the group divided. The “Old Providence” group continued in the area near the present location. The other group formed the church that became “New Providence”. Second, the word “Associate”. What does that name tell us? Most people assume it has something to do with the way the churches relate to each other. They assume that “Associate” means that the Churches of the denomination are “associated” or are in an association. But that understanding would not be an accurate one. The name really only has meaning in an historical context. It comes from events in Scotland when a group of ministers left the Church of Scotland and formed a new group. They were known first as “seceders” and then as “the Associates”. They formed the “Associate Presbytery” in 1733. Third, the word “Reformed”. When people see this word they often attach one of two meanings. Some see in it a statement about what has happened to the church, so that it has been changed or reformed. Others see the word as a word that identifies the system of belief of the Church, that it professes the beliefs of “reformed theology”. This second use would be an accurate description of the beliefs of the ARP Church, but the name does not derive from that meaning. This word is also an historical name. It comes from a second group of people in Scotland, which also left the Church of Scotland. These people were known most often as “the Covenanters”. A group of Covenanters came together and formed “the Reformed Presbytery” in 1743. Fourth, the word “Presbyterian”. The meaning of this word is more obvious and generally understood. It identifies the Associate Reformed Presbyterian Church as being a member of the Presbyterian family of churches. It says something about our beliefs, our method of church government, and our worship. Presbyterian means “Rule by Elders” This rule by elders occurs in a local church, in a regional area grouping of churches called a “presbytery”, and in the national church called “The General Synod of the Associate Reformed Presbyterian Church. 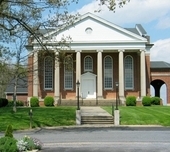 There are a number of Presbyterian denominations including the Presbyterian Church in the United States of America (PCUSA), the Presbyterian Church in America (PCA), the Orthodox Presbyterian Church (OPC), the Evangelical Presbyterian Church (EPC) and the Reformed Presbyterian Church North America (RPCNA).